I bought my first pair of readers the other day – the not-so-cool, low-prescription reading glasses displayed right next to the ultra-cool sport shades and sunglasses in your local drugstore. It was a traumatic development and a literal eye-opener at the same time – traumatic because of my ridiculous vanity, and an eye-opener because said vanity had reduced me to only being able to read print held an entire arm’s length away from my face. My dear friend stood their patiently (and somewhat amazed, I’m sure), as I tried on more than a dozen pairs of readers – not to test their effectiveness, but their attractiveness. I finally settled on a pair with purple and black frames, which I have yet to wear in public. But reading in the privacy of my room later that night (with more ease than I’d experienced in months), I laughed at myself for suffering so needlessly and so vainly for so long. Pride can sometimes keep us from taking the help that is just an arm’s length away. In Matthew 9 and Matthew 14, help was a mere arm’s length away. In both of these passages, Jesus is in ministering mode, making His way through pressing crowds, healing physical diseases while preaching on the disease of sin (Matthew 9:12-13, 14:14). The better-known of the passages is no doubt Matthew 9, where the woman with the issue of blood (a disease that rendered her physically, socially, and spiritually unclean in Jewish culture) approaches Jesus from behind and touches the hem of His garment (Mark 5:25-34, Luke 8:43-48). Power goes out of Jesus, and the woman is immediately made whole. But interestingly, she was not the only one to receive healing by merely reaching out and touching Him. And then another healing marathon takes place. The men of Genessaret grasp the awesome possibilities of their latest visitor, and they compel people from the surrounding area to come and touch the “hem of His garment”, instantly healing them just like the woman in Matthew 9. But there’s more to that hem than meets the eye. 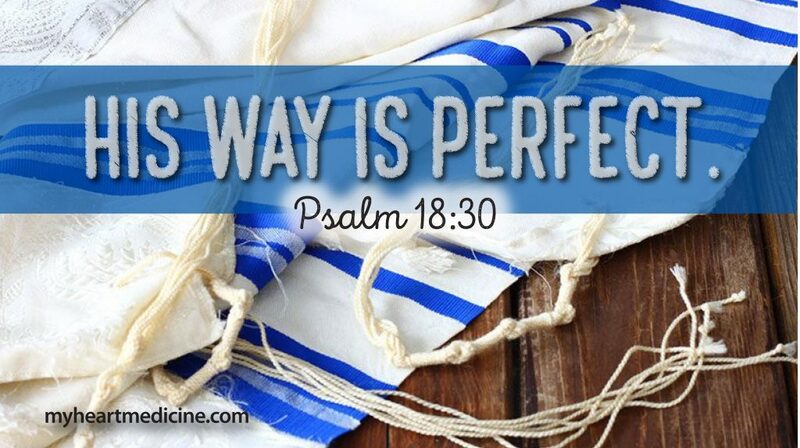 In the original Greek, the words used to describe the hem of Jesus’ garment refer to tassels that every Jewish man wore on their four-cornered tallit or prayer shawl. This particular feature was ordered by God in Numbers 15 (Verses 37-41). The tassels were a reminder of God’s laws and God’s authority in their lives, and they were a public declaration of their faith in God (Deuteronomy 6:5, Matthew 4:10). There was no magic in those tassles, but to touch them on the garment of Jesus was to acknowledge Him as Lord and Messiah. From the woman with the issue of blood, to the nameless in need at Genessaret, healing started with claiming Christ as Savior and Sovereign Lord of all (Romans 10:9-11, Colossians 3:1-16). And it’s the same for us today. No healing can take place until we give Christ His proper place in our hearts and lives (II Corinthians 1:5-7, Philippians 3:10, Colossians 1:17-19, James 5:16). We all want healing on some level – from heartaches, from our past, even from physical ailments and the cares of this world. But how often are we willing to allow His sovereign will to be done in the situation? How often are we willing to let God be God and completely trust the outcomes and the order of events to Him? My advice to you today – let go of what you think should happen. Rather, give God a blank check. Stop trying to tell Him what to do and just surrender – really surrender – to what He wants to accomplish in you and through you (Proverbs 3:5-6, Ephesians 3:14-21, Philippians 2:12-13). His way may not be what you had in mind, but it will yield more than you could ask for or imagine. Tell God you will do what He wants you to – and mean it. He’s not looking for conditional surrender. He’s looking for you to place your complete trust in His plan, His timing, and His authority. Surrender it all.